The hottest brands at throwaway prices! That’s what in store for you at Urban Monkeys in Kalyan Nagar. H&M, Diesel and Calvin Klein are on display here. The Kalyan Nagar/Kammanahalli area has, in the recent past, become an export surplus hub of sorts. Don’t believe us? Then, read all about it here, here, and here. Today, we are making another addition to that impressive list. Urban Monkeys on CMR Road is where you need to empty your bank accounts, we think. A pretty large space, Urban Monkeys has plenty for women and men. For the ladies, there are tops, dresses, and denims in the clothing department. We spotted simple cotton tops from H&M that are perfect for casual wear and were priced at a mere INR 599. On the same rack, there were offerings from Annabelle and Forever 21. In the dress section, there were the likes of Allen Solly (INR 799) and Elle. You can also pick up denims from Diesel for INR 1,899 and they also stock shoes and bags. A larger section of the store is dedicated to menswear. There are racks of casual and collared tees from brands like Zara and Lacoste (prices begin at INR 799). You can then move on to their formal wear and you can pick up pure, Egyptian cottons from De Fursac. There’s also Kenneth Cole and Massimo Dutti. Briefs from Calvin Klein, jackets, belts and wallets are available too. he store does have fitting rooms so make sure you try everything before you plonk down your credit card. 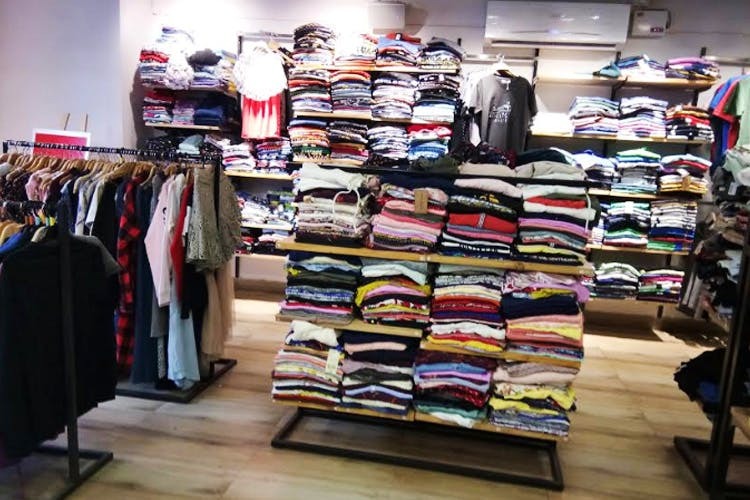 Also, while export surplus stores are really great places to find those one-of-a-kind outfits and also your favourite high street brands, it all depends on stocks received, so you may or may not be in luck every time you visit.